Legislative district mapping is made easy with the USgeocoder mapping engine. Being one of the very few OEM companies around, USgeocoder provides you the most accurate legislative district maps with the latest boundaries for state upper house and state lower house. The accuracy of legislative district maps depends on the data used to create such maps. 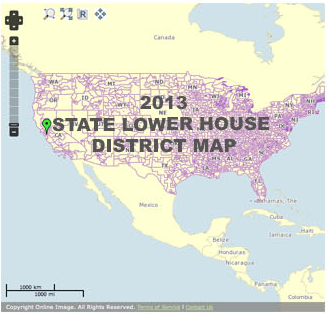 USgeocoder uses US Census TIGER and the data produced by the state redistricting commissions to produce Legislative District maps of the current sitting legislatures, future legislatures and past legislatures. USgeocoder legislative maps are kept up to date with changes instituted by the states or their courts. Candidates for election can use our maps based on what the districts will be when they are running for office. Advocacy groups can use our maps of sitting legislatures to lobby and advocate for their cause. You can rely on USgeocoder maps to reflect current reality or future reality based upon your needs. 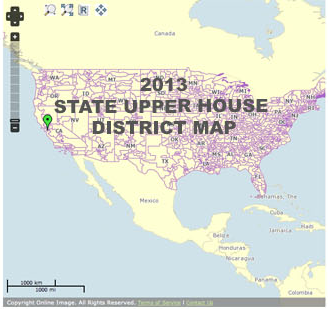 State upper house and state lower house legislative district maps are default layers provided by the USgeocoder mapping engine. You can use an instance of the map you see on USgeocoder live demo to make automatic maps to suit most of your mapping needs. USgeocoder base map displays transportation network, water features, land marks, state, county, incorporate/un-incorporate areas, tribal lands, federal public lands and military installations. You can choose any of these layers to show with the state legislative districts. Do you have your own data and would like to show its relationship with state legislative districts? Try USgeocoder legislative district mapping service! With the top accuracy of state legislative data sources, we can develop custom district maps for your own applications and websites. Looking for state legislative district mapping service for your own application? Give us a try! Please call 1.888.938.6732 or send us an online inquiry for your custom needs. Take a test drive on our Live Demo. It will mark the location of the given address on the map. You can turn on the State Upper House 2016 and State Lower House 2016 layers to see its districts and the legislative district maps for the entire nation as you zoom out.